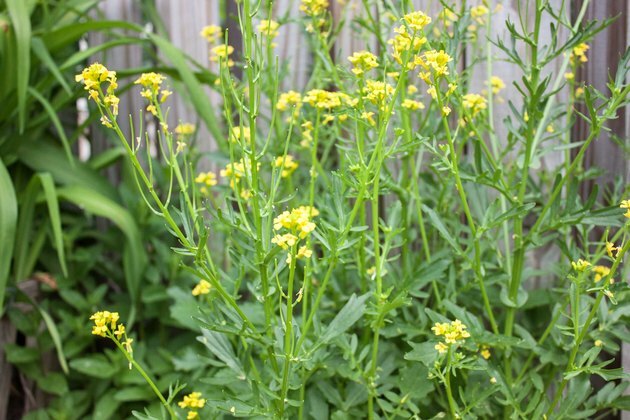 Yellow mustard weed, more commonly called wild mustard (Brassica kaber or Sinapis arvensis), grows as a winter annual weed throughout the western parts of the United States, but a summer annual weed in cooler areas. Plants stand about 3 1/2 feet high on thick stalks and bear bright yellow flowers that give way to round, purple to black seeds. Although attractive, wild mustard plants can quickly spread throughout thin turfgrass, developing into thick, dense patches that run out desirable vegetation. Fortunately, you can control unwanted wild mustard plants using mechanical, chemical and cultural control methods. Wild mustard reproduces only through its seeds, and each plant produces between 2,000 and 3,500 seeds in its lifetime. The seeds typically drop and germinate near the parent plants, which allows the weed to quickly spread out into thick patches. The seeds that don't germinate immediately can survive up to 60 years in the soil. 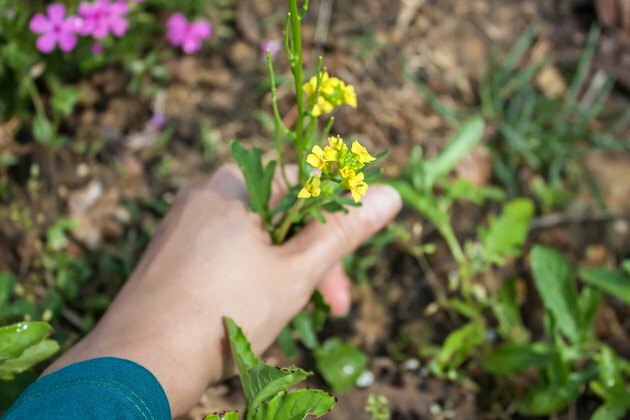 Hand-pulling or grubbing out wild mustard plants before they're mature enough to produce seeds is vital to controlling weed populations. Wait until after it rains or moisten the soil beforehand to make the removal process easier. Inspect the area every year to check for new plant growth, repeating the removal process until all yellow mustard weeds are gone. Keeping your turfgrass thick and healthy by following the proper cultural techniques helps prevent yellow mustard weeds from invading your yard. Mow your grass with the blade set to 2 1/2 or 3 inches high to promote deep, healthy roots. Mowing your lawn at a lower setting can weaken grass blades and lead to a thin lawn that invites mustard weeds into the area. Giving your lawn infrequent but deep irrigation also helps grass develop strong, deep root systems. Lawns generally need 1/2 to 1 1/2 inches of water, or enough to moisten the soil to a depth of about 5 inches. 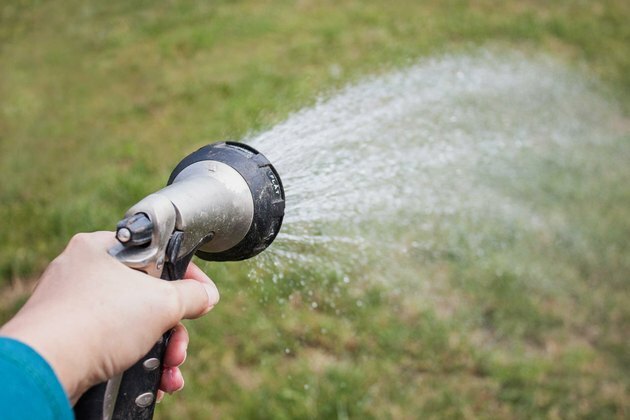 Wait until your lawn looks slightly wilted before you water the grass again. Most lawns require a nitrogen fertilizer every six to eight weeks during the active growing season. The Utah State University Extension recommends applying 1 pound of actual nitrogen for every 1,000 square feet of turf. This means using 2 cups of 10-10-10 fertilizer for every 100 square feet of lawn area. As always, read and follow the application instructions on your specific product's label. 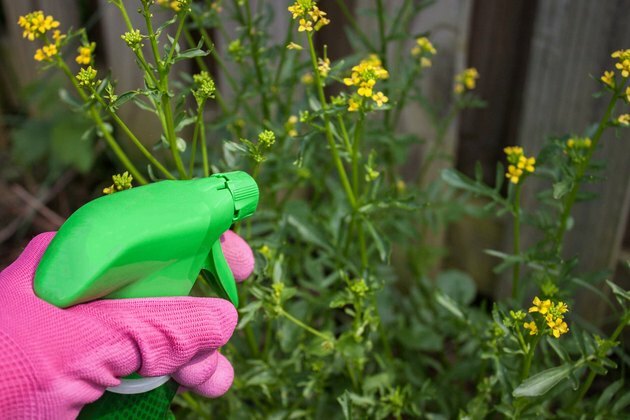 Various chemicals can help you kill wild mustard without harming your turfgrass, including herbicides containing the active ingredient 2,4-D, dicamba, triclopyr or any combination thereof. Carefully read the manufacturer's instructions before using. A typical product containing 2,4-D and triclopyr recommends spraying actively growing weeds with a solution containing 4 to 6 ounces of product for every 3 gallons of water. Use a small garden sprayer to apply the solution to the weeds until the foliage glistens with moisture. Wait at least 30 days before repeating treatment, if necessary. Reapply if rain occurs within 24 hours of treatment. Spray herbicides only on calm days so the chemicals don't drift out of the treatment area. Avoid spraying herbicides near food crop plants. 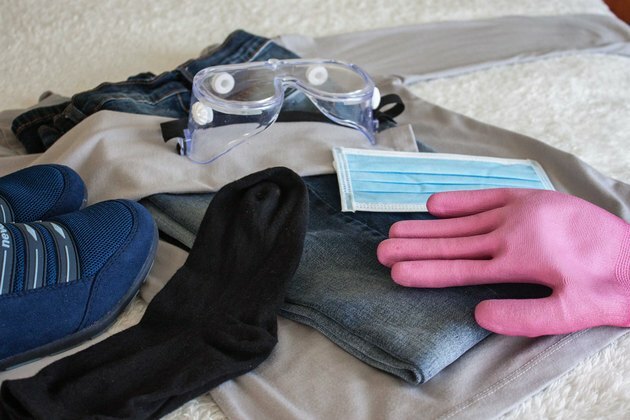 Herbicides can cause moderate eye and skin irritation on contact, so put on protective eyewear, long sleeves, pants, shoes with socks, a face mask and waterproof gloves when mixing and using herbicidal solutions. Keep people and pets out of the treated area until the solution completely dries. Growing up in a family full of landscapers and carpenters, Amber Kelsey learned all about home and garden topics through osmosis. Her articles in The Green Girl's Guide and Altar demonstrate her eco-friendly nature, and she uses organic practices in her various gardens. Kelsey holds master's degrees in English writing and cultural anthropology.